Pennysteel Cottage01377 217523work01377 217754fax Self-cateringLocated in the beautiful fishing village of Staithes overlooking the harbour. Dating back to 1800 this old fisherman's cottage is set in the heart of the village with breath taking views from every room and the terrace, which gives an opportunity to relax outside have a BBQ or just enjoy the scenery. Dogs accepted in adjacent pubs. Staithes narrow, winding, cobbled streets are a delight to explore, plus its pretty harbour with cafes and pub. Excellent walks along the coast, the cliffs tops and in the North Yorkshire Moors National Park make the cottage an excellent base for a holiday. Close to Whitby and 'Heartbeat' Country gives it an added bonus. The cottage is only a few yards from a traditional local pub serving excellent value bar meals; cafés; craft shops; art gallery and general stores. Comprising of three storys, it has a double room, single room, twin (attic room), bathroom with toilet and shower, toilet, lounge/dining room and kitchen. It has a log-burning stove which can be sat in front of whilst looking out to sea beyond the terrace. A TV video, DVD, CD player, plus games are provided. Wi-Fi. Parking is free in the car park at the top of the hill. The peacefulness of the village is partly due to restrictions on traffic in the village. 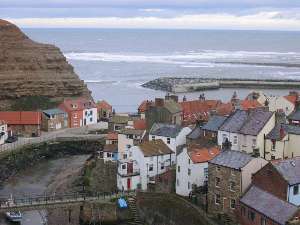 Located in the beautiful fishing village of Staithes overlooking the harbour. Dating back to 1800 this old fisherman's cottage is set in the heart of the village with breath taking views from every room and the terrace, which gives an opportunity to relax outside have a BBQ or just enjoy the scenery. Dogs accepted in adjacent pubs. *Please note pets are only permitted if prior notice has been given. If booking direct please inform the proprietor. If booking online please give the details in the special requirements. Overlooking picturesque harbour. Close to pubs (serving good food), cafes, local shops, tourist shops. Excellent for walking along cliff top walks (Cleveland way). Close to North Yorkshire Moors & National Park. Beach and coastal walks. Children welcome from any age. Pennysteel Cottage offers weekly bookings starting on Saturday and short breaks of 4 days starting on any day in some seasons. Leave the main Whitby to Middlesbrough road (A171) by turning into the village of Staithes (new aprt at the top of the hill). Carry on until you reach a mini-roundabout, on your right you will see the public car park where you can leave your car during the week (permit supplied). Carry on down the steep hill ahead of you, which eventually becomes cobbled, follow the road around to the right. About 15 yards on your left is the Royal George pub and almost oppositte, the Endeavour restaurant. On the same side as the pub, park your car to off-load and take the 2nd little alley way from the pub (Boathouse yard). The yard forks, take the left fork. Pennysteel Cottage is at the end of the yard on the right. It fronts on to the harbour. Buses from Whitby and Middlebrough stop at Staithes on the A171, at the edge of the newer part of the village. Access Information This access statement has been provided for your information. Location & Communications: • The cottage is located in the old fishing village of Staithes within 2 minutes walk of the local pub serving excellent, good value food. • There are no parking facilities for cars at the cottage as parking is not permitted in Old Staithes (Except for very limited spaces). However, a FREE parking pass is available for visitors’ cars in the public car park at the top of the village. Access to this is up a steep hill, which takes about 7 minutes to walk. It is not suitable for those with difficulties climbing steep hills. • Cars can be parked on the High Street for off-loading baggage, and then must be moved to the car park. There is a short passageway down to the cottage. The cottage is at the end of this, overlooking the sea. The cottage is secluded and away from the High Street. • A local bus service collects passengers from the village (via a bus stop at the top of the hill on the main road - A174), serving – Whitby and Middlesbrough. Rail links can be found in these towns. • The nearest medium sized town is Whitby (10 miles) and small town – Loftus 4.3 miles away. • The cottage has a BT telephone call box. Mobile phone reception is poor. Description: • There is a paved footpath from the High Street to the cottage. • The entrance doorway to the cottage is a standard width. There is no step into the cottage. • The entrance way leads into a small lobby where the telephone call box is situated and some hangers for coats, and the electricity shut off box. • There is then another doorway of standard width, leading into the Lounge and Dining area. There are no steps in this room. The room has mats and quarry tiles on the floor. • From the Lounge there is a step of with a very slight step of 10 cm / 4 ins. into the compact Kitchen which overlooks the sea. There is a set of small folding steps available for those of short height to reach the top shelves. The kitchen units are all easily accessible. • Patio doors lead out of the Living Room onto a paved Terrace which overlooks the sea. There is a wooden garden table and four chairs for eating out, and a built in BBQ. There is a sturdy wall of 120 cm / 4 ft at the end of terrace. • The stairs leading up to the first floor are of moderate steepness. There is a handrail up one side of these. The stairs turn half way up forming a “U” shape. The stairs are fully carpeted. • On the first floor is a Single Bedroom and a Double Bedroom (no steps into either of these) and a Toilet with a Wash Basin. Both bedrooms have wooden floors with rugs. • A second set of stairs of moderate steepness, (carpeted) and a low beam at the top (also in a curved “U” shape) takes you to the top floor where a Twin Attic Bedroom can be found (with low height at the foot end of the beds) and the main Bathroom having a Bath with stand in Shower, Toilet and Wash Basin. The bedroom is fully carpeted, the bathroom has a linoleum floor covering. • There are smoke detectors on all floors.